Your Questions Answered: Is Pressure Washing Really Good for My House and Roof? Your house is more than just a building – it’s the place that you call home, the space where you feel comfortable after a long day of work. It’s also an extension of you – and as such, the marriage of comfort and curb appeal are essential. Enter pressure washing. This is arguably the most effective way to rid your home, roof, and any other exterior surface of dirt, mold, dust, and other stains. However, it’s important that professionals do the job to ensure that your home isn’t damaged in the process. While traditional pressure washing methods utilize a high pressure that can inflict damage to a home, Pressure Kleen sticks with a low pressure that gently yet effectively accomplishes its mission. As a result, homeowners can enjoy a beautiful house and the peace of mind that its good value is intact. Pressure cleaning doesn’t just improve the first impression of your home. It also protects it, preventing the growth of mold or other matter that would otherwise diminish its quality and value. 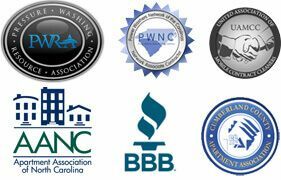 We are proud to provides solutions to your Fayetteville pressure washing needs. Schedule your appointment today so that your home can put its best foot forward!